Not surprisingly, any successful, busy event planner needs a little bit of help from time to time. Fortunately, there are many apps available for event planners who want to have all of their bases covered for their next big gathering. Here are a few examples of must-have apps for event planners. With Time Bridge, an event planner can avoid playing phone tag and exchanging numerous emails with clients. This app helps event planners to arrange meetings on days and at times that are convenient for both themselves and their clients. An event planner can offer a choice of up to five days that he or she is available to meet with a client. In turn, a client can provide the times and dates when he or she is available. 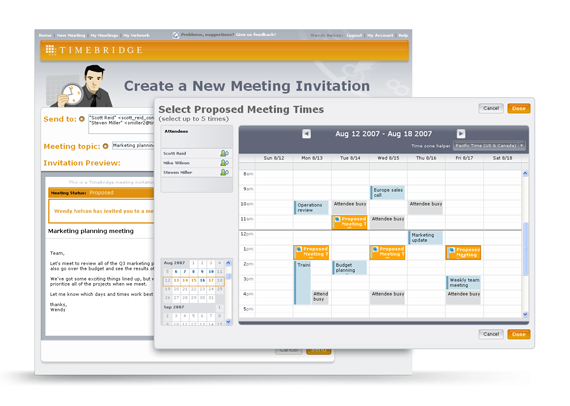 Time Bridge does the footwork of coordinating those schedules and coming up with the most optimal meeting time for both parties. All the event planner has to do is show up ready to work! The task of making a seating chart for events both small and large is easy with the help of Table Top Planner. This app allows an event planner to avoid the old fashioned way of creating a seating chart with pencil and paper! A person can access the chart at anytime to make additions and adjustments. If there is any seating issue at the event, a planner can consult this app and solve the problem in fast fashion. This streamlines a time-consuming task so a planner can concentrate on other more creative aspects of the planning process. Pro Party Planner is an app that is helpful to an event planner in many ways. This app keeps track of deadlines for various tasks of the planning process. More importantly, the app subtracts from the budget when money is spent, so a planner stays loyal to the client’s budget. The app also notes when particular tasks are done allowing a planner to have a good idea of how many things still need to be taken care of. The information on tasks can also be shared with others who are involved in the planning process. With Super Planner, an event planner can handle issues such as the venue, food, beverage and wait staff. This app helps take care of the details of planning how much food will be needed for a party along with how many beverages. It is even specific to the types of food and beverages needed for a gathering. In addition, the app can determine how many staff members will be needed for an event of a certain size. This allows an event planner to avoid the embarrassment of ending up with too few staff members to serve the guests at an event. In short, this app offers an extra element of organization when it comes to every aspect of an event. Jason Kane is a professional blogger, amateur event planner and amateur app developer. He recommends SOASTA for all app performance testing needs.